Knowing how to make money on Craigslist can be incredibly useful, specially in these hard economic times when many people are struggling to find and keep their jobs. While there are many ways to make money with Craigslist and indeed online, most people are looking for free ways to make money working from home. Maybe they don’t have any money to invest, or maybe they have the money but don’t want to risk it. Whatever the case may be, there is a simple way you can profit from Craigslist without spending a dime. One of the best ways to earn cash online is through classified sites, such as Craigslist. But most people simply over look it, and most are afraid of it because of all the make money Craigslist scam stuff. 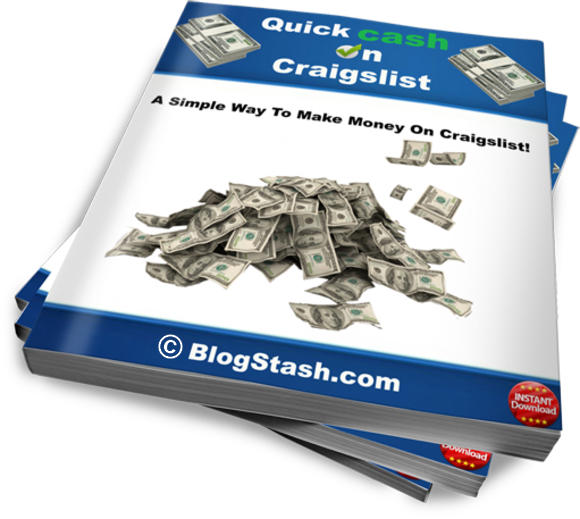 Check out my brand new eBook Quick Cash On Craigslist! A brand new way to make money on Craigslist that I guaranty you have never heard of before. In fact, it wouldn’t even be possible until a few years ago, but today it is. Since Craig Alexander Newmark launched Craigslist in 1995, CL has come a long way. It serves over twenty billion page views per month! Craigslist is one of the most popular websites in the world, and millions of people visit it each month. And that makes it easy to earn money on Craigslist. If you already know how to make money on eBay, you may have a little easier time making money on Craigslist, as it has some similarities. There are no “how to make money with Craigslist secrets” here. To get some of that Craigslist money for free, you have to look into “For Sale” category. In the “For Sale” category of Craigslist, there is a section called “Free Stuff”. In this section, people give away stuff they don’t want, for free. You simply have to go pick them up. Sometimes people even include pictures of these items. The free section of Craigslist is a gold mine, if you know how to mine it! If you don’t, no worries, as I am about to teach you how to make money using Craigslist. Go to Craigslist.org and register for a free account, if you already don’t have one. You can register for free, and it only takes a few seconds. Search your local Craigslist, and look for free items that are in good shape (which most of them are). Sometimes you have to contact the owner to let them know you are going to pick it up, but in most cases, they will put the item in front of their drive way, which you just have to stop by to pick it up. A pickup truck would be very handy here, as it will allow you to pick up bigger items. But you can get by even without a truck. This step is the “hardest” part of making money with Craigslist. If possible, spend a few minutes to clean it up, or whatever it needs to make it look better. For example, if it’s a desk, put a fresh coat of paint on it. Just make the item look as nice as you can. When people look for stuff to buy on Craigslist or anywhere else for that matter, they tend to click on ads with pictures. People want to see what it looks like. So, spend a few minutes taking a few pictures of the item from different angles. Now you need to list your item on Craigslist. Login, and list your item in the “For Sale” category, under the appropriate section. This is very important, make sure you find and list your item under the right section. For example; if the item is a chair, list it under “Furniture”. If the item has some history to it, or there is anything interesting about it, use that to add a nice description for the item, even if it’s just a few words. In your ad, make sure you put your phone number or email address, so people can get in touch with you quickly. Now that you have listed your first item, go back and keep looking for other free stuff. Do this over and over again. After a while, you will know what items sell easier and faster, and what kinds of items don’t. As you do this over and over, you will gain some experience, and the process becomes much faster and easier. This is all it takes for making money on Craigslist, free. In a few hours or so, you will start to get calls and emails from people who want to buy the item. It is unbelievable how easy it is to make money with this method. You may not believe it, but there are people who make a living, picking up free stuff from Craigslist, and selling them back on Craigslist for a profit. It doesn’t take any skills, you don’t need any money, you don’t need a website, nothing. You don’t need anything but a free Craigslist account and an Internet connection. It’s as simple as that! If you want to make money without spending a dime, and you don’t have any skills to offer, this is the way to do it. Finding free stuff, and selling them back on Craigslist is how you can make money on Craigslist.